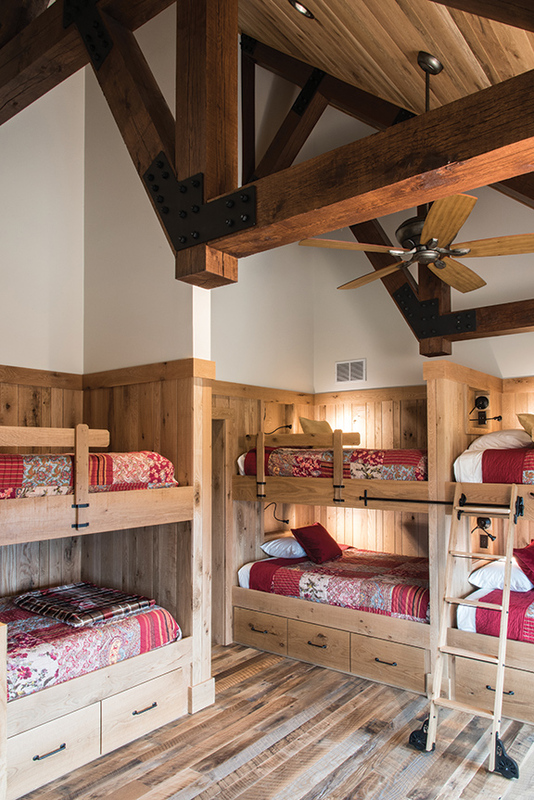 A rustic, multipurpose barn is the perfect place for a family of nine to make lifelong memories. Neutral colors, natural materials and weathered finishes work together in teh homey hangout area. Ready to entertain for fall, tabletop and mantel accessories from The Rusted Chandelier complete the look. 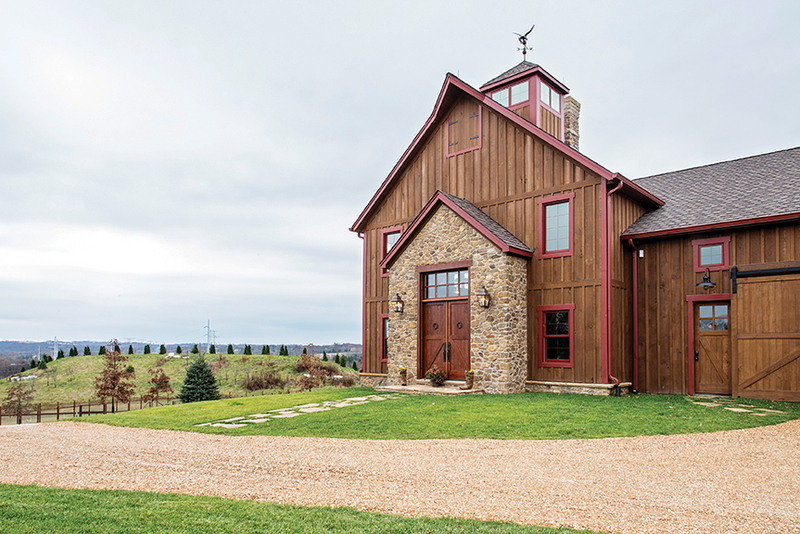 Tucked away on a secluded stretch of Missouri farmland, Ed and Mary Ann Ignaczak’s custom barn was designed with functionality and family in mind. Their three-story hidden hideaway echoes the charm of the surrounding property while giving them a spot to enjoy the outdoors and each other. In need of an respite from city living and a place to store a massive haul of farming and hunting equipment, the couple purchased the 240-acre plot in Labadie five years ago and begun work on crafting a second home from the ground up. “Our family is very outdoorsy, so we wanted to have a space where we could entertain and make the most of our land year-round,” explains Ed. Brimming with ideas, the couple teamed up with Lauren Strutman of Lauren Strutman Architects and Andy Bozdech of Bozdech Custom Homes to create the one-of-a-kind structure they desired. On the top of their wish list was for the barn to be built from non-stock materials, a challenge Bozdech was excited to tackle. 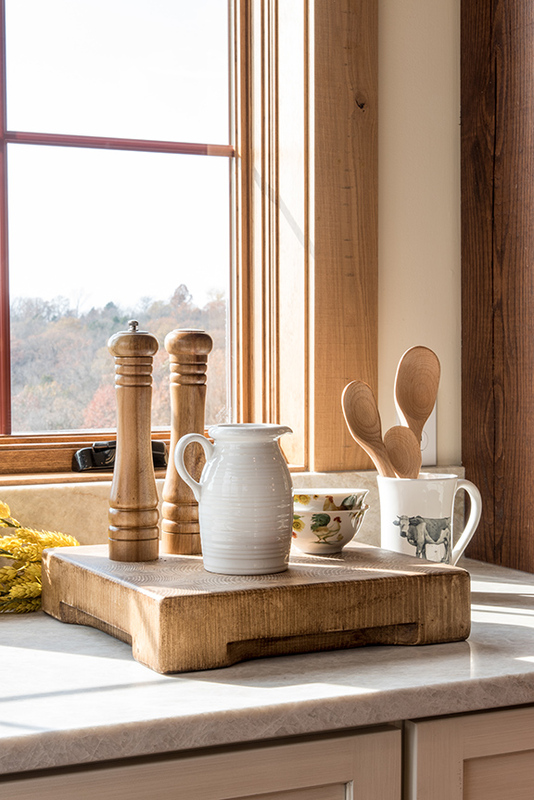 “The inside and outside of the barn is made from White Oak that we sourced from Kentucky,” says Andy. The timber frame, custom-developed by Frontenac Engineering Group, is not only integral to the barn’s intricate structure but is also an essential element of the home’s rustic style. When you walk in through the garage, which much like the basement is filled with farming equipment and the family’s off-road toys, you are greeted by a cozy great room and gorgeous kitchen, both spacious enough to comfortably fit the Ignaczak’s party of nine and their closest friends and relatives. 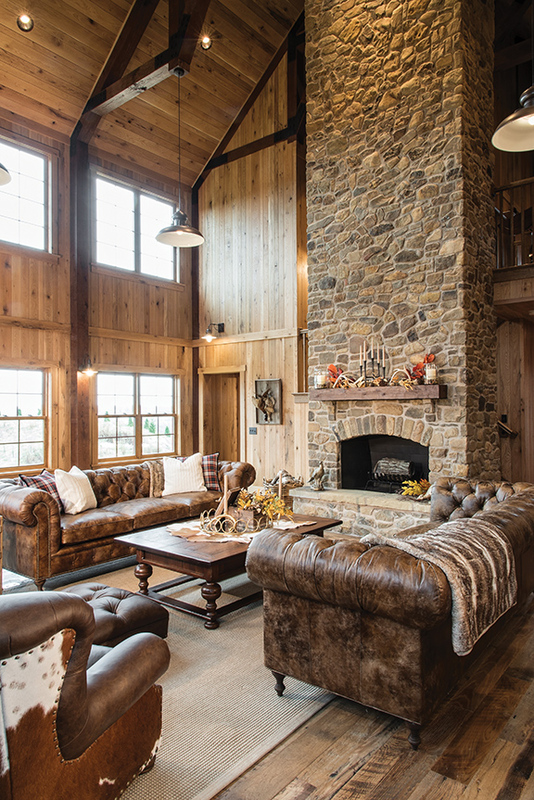 A thoughtful combination of neutral colors, natural materials and weathered finishes work together to highlight the reclaimed barn wood floors, luxurious leather couches and stone fireplace in the homey hangout area. 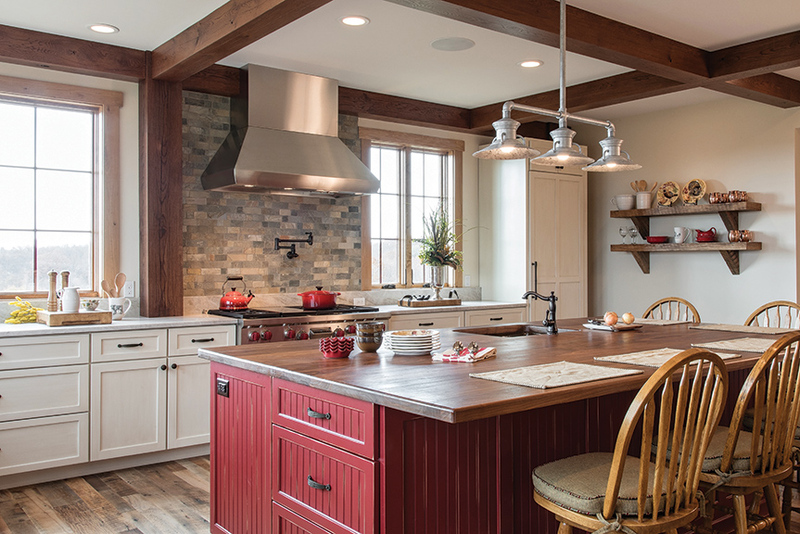 The heart of the barn, the large kitchen, is complete with an oversized walnut island in a punchy red hue and gray granite countertops, and is decorated with a similar palette of reclaimed resources to pull the two spaces together. A hickory staircase leads you to a roomy loft, which houses a bunkroom that sleeps 14. Why so much room? “I guess you could say we have a pretty big family,” Ed laughs. A fitness center and an additional area for lounging and watching television are both spots in the home that are usually inhabited by the couple’s seven children – that is when they aren’t outside working in the horse barn, picking apples in the apple orchard or lounging lakeside. “With such a high-caliber builder like Andy and imaginative homeowners, we were able to create a unique structure that tells its own story while staying true to the roots of the property,” mentions Lauren. What was initially thought of as a permanent home for an overflow of equipment and tools is now where this close-knit bunch shares countless laughs and makes unforgettable, lasting memories together.